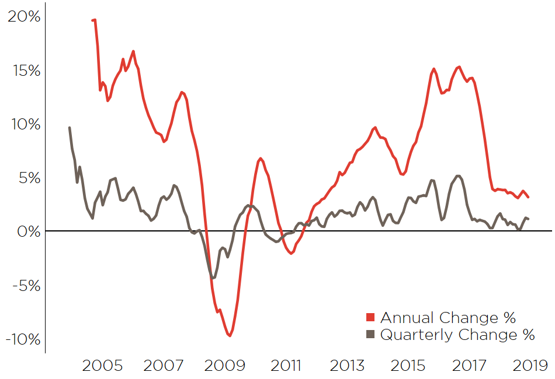 According to the December CoreLogic QV House Price Index, property values in New Zealand grew by 1.2% over the last three months, a minor reduction on the rate of growth at the end of November. 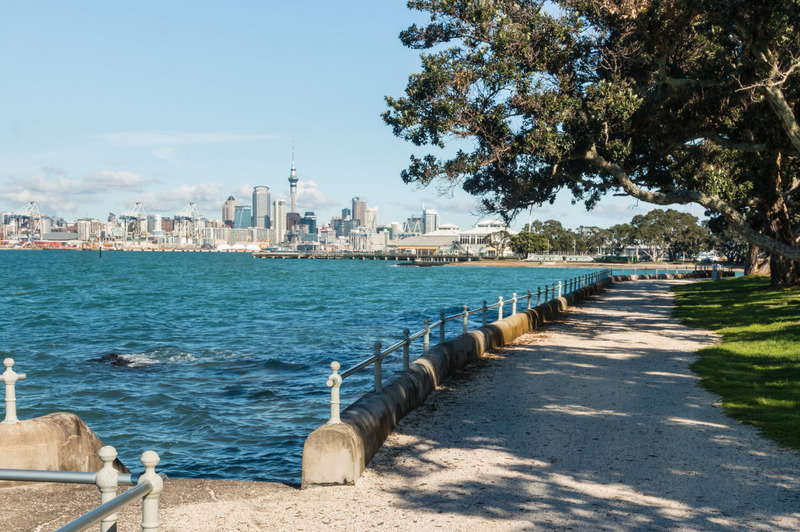 A slight drop (-0.2%) in the Auckland index for December took the annual rate for all of 2018 into the negatives (-0.4%) for the first time in just over a year. 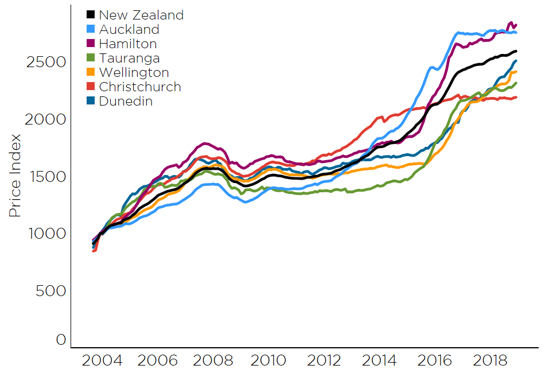 This further illustrates the weakness of the current Auckland property market as unaffordability, restrictive lending and Government influence continues to impact the market. 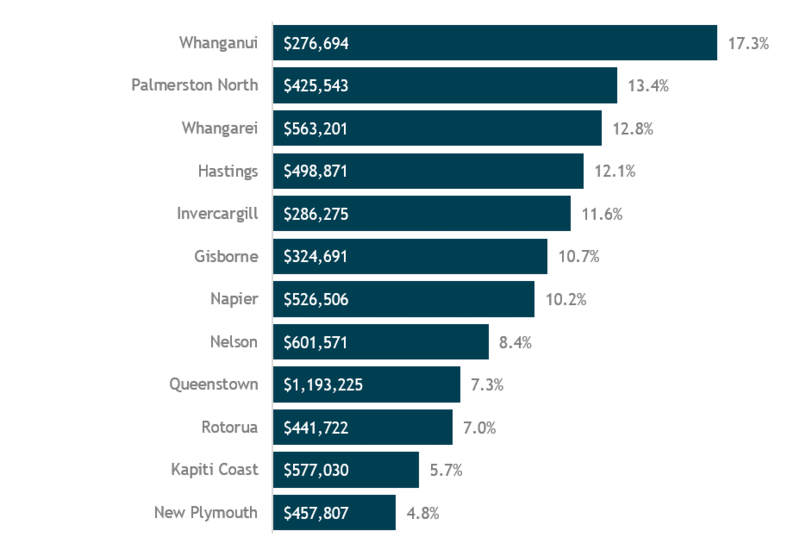 Within Auckland, the most expensive areas saw the greatest weakness over the full year. North Shore and Auckland City (isthmus), with average values above $1.2m, saw -1.1% and -1.0% drops in 2018. Manukau saw the greatest increase over the year, although still a restrained 1.2% (in the wider context), with the outer areas of Rodney and Franklin experiencing a similar increase of 1.1%. Papakura, at 0.6% and Waitakere at -0.2% round out the rest of the super city. Meanwhile, the Tauranga property market finished the year strongly, with 1.0% growth in the December index, however the year of ups-and-downs is well encapsulated by the relatively low annual rate of 3.9%. 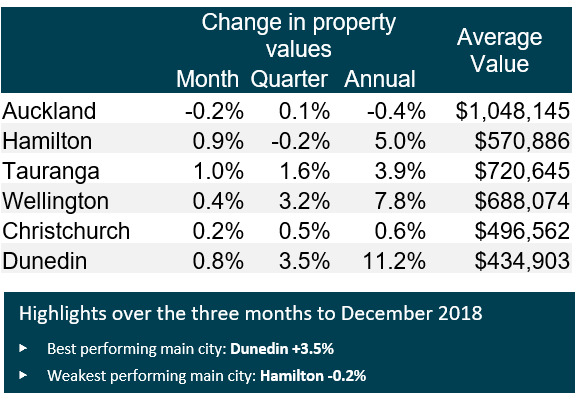 Hamilton property values also travelled a rocky road in 2018, but despite a minor drop (-0.2%) in the final three months of the year, the annual rate (5.0%) was greater than in Tauranga, where the average value ($721k) is more than 26% greater than Hamilton ($571k). Investors remain a strong presence in Hamilton, with 39% of sales to this group in the final quarter of 2018. This is back to levels seen earlier in the decade, after their activity had previously increased to 50% of sales in 2016 off the back of Auckland specific LVR limits driving investors down SH1. The modification of the LVR limits to be applied nationwide brought a swift drop in activity, with investor share in Hamilton dropping to less than 40% since Q2 2017. In Canterbury the outer districts continue to outperform most of the city areas, with Banks Peninsula the only exception - although the annual growth rate of 2.9% for 2018 simply reversed the losses experienced in 2017. Values in Waimakariri grew by 2.0% over the year, while in Selwyn annual growth finished up at 1.7%. Christchurch Central & North property values were the worst performing in the City (-0.3%) while the rest of the city saw very modest gains of roughly 1%. Across the provincial centres as a whole, annual value growth (9%) continues to outstrip the main centres (1%) when grouped together. Rural centres also saw value growth increase an average of 6% over the year. Whanganui sustained a high level of growth throughout the end of the year to finish the year with a record average value of $277k – an increase of 17.3% since 2017. Value growth in the provinces has fluctuated around the country. The annual rate of growth increased in 5 centres, decreased in another 5 and stayed consistent for the other two. This helps show the variable patterns of similarly sized areas, and illustrates the need to understand a local market before investing in any property market. In the December index for Hastings there was a significant increase (7.2%), with properties valued under $400k in particular seeing very strong sales price. This is a section of the market often dominated by investors and first home buyers, although movers have increased their presence in Hastings over the last few years. “In Auckland in particular, there’s still a deficit of supply from years of under-building, which is likely to guard against a significant drop in values, given still-strong population growth.